If you are into woodturning, then you probably already know how important a chuck is. Without a chuck, you will not be able to hold a block of wood in place. 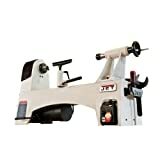 We already know that woodworkers require a good lathe to work effectively and efficiently. A poor quality lathe can severely affect the precision, details, and quality of your project. 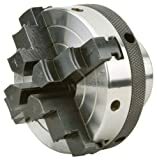 Although, a chuck is just a component used in a lathe, having a good chunk is equally important to ensure your work maintains superior quality. There are many chucks available in the market, but not all the chucks are up to the mark. However, the PSI Woodworking CSC3000C Barracuda wood lathe chuck System has gained quite a bit of success among both beginner and expert woodworkers for its outstanding reliability and performance. In this article, we will look into different aspects that truly make this particular chuck stand out from the rest. Now, we already know this feature is not very uncommon, as you can get this similar wrench for adjusting jaws in most well-known chucks. However, the one that ships with the Barracuda are slightly different. The handle of the wrench favors single-handed use, unlike the other T-shaped wrench. Unlike many other T-shaped wrenches that require a lot of force to be applied to the T-shaped wrench in order to open up or close the jaw, this wrench is very easy to use and works smoothly. In fact, a simple turn with one hand can open up or close the jaws entirely without too much of a hassle. This particular feature makes using the chuck very simple and enjoyable. One of the problems that most woodworkers face is keeping individual components safe from external damage. Let’s face it, woodturning does require pretty expensive components, and we would not want any machinery or equipment to get damaged no matter how big or small they are. Fortunately, with the PSI Woodworking Barracuda woodworking chuck, you wouldn’t have to worry about such a problem. This is because you get a pretty hefty carrying case with the product. Not only is the carrying case very sturdy and durable to prevent any sort of damage to the chuck and the additional components it comes with, but it also has individual places in it to store each of the equipment separately so that they do not get lost. Unlike many other generic chucks in the market that are difficult to set up for use, the Barracuda is almost ready to be used out of the box. It requires very little assembly. All you have to do is attach one of the 4 sets of jaws provided in the box, based on the type of project you will be working on. Apart from that, each of the jaws in each set is numbered. This means you can easily screw them into their respective jaw slides without too much difficulty. You do not have to worry about mistakenly screwing in the wrong jaw to the wrong jaw slide. This sort of set up makes the Barracuda perfect for those who are getting into the woodturning game. Getting the right chuck for your lathe is a tricky business. Often times a particular chuck that we buy on the market may not correctly fit into the spindle of the lathe we own. This could be a major problem when woodturning, because an improperly attached chuck is very likely to overhang or fall off. This might damage the block of wood that you are working on, or affect the quality of the project you plan on undertaking. Thankfully, such a problem can be resolved to be means of an adapter. The PSI Woodworking Barracuda chuck ships with an adapter in the box. The adapter is suitable for a ¾ by 16 TPI spindle. 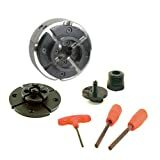 So, if you have a lathe with such a spindle then you can easily use this adapter to attach the chuck to the lathe. 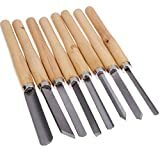 This chuck works best for small wood projects. Provides safety features if you forget about the chuck key. This chuck can easily be recommended to beginner woodworkers. Many important accessories are provided with the chuck. It is quite light at 9 pounds. You can get a variety of faceplate options. The safety case is prone to damage according to some customers. Some people may consider it to be an inferior product because it is made in China. The jaws provided may not be reversible. Some customers complain about the chuck key falling out. The finish of this product is not very good. Question: Can you tell me how to place a key chuck in the Barracuda? Answer: It is possible to place a key chuck in the Barracuda. On the polished and visible side of the chuck, you will find opposing holes. This is where you can insert the key chuck. Question: Is this chuck reversible? Answer: The chuck is not reversible, because there isn’t any type of set screw to hold the chuck securely in place while running in reverse. You need to have the appropriate locking system for the chuck to be reversible. 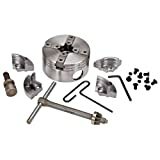 If you are a beginner and you are looking for a chuck that’s worthwhile and performs like a charm then you cannot really go wrong with the PSI Woodworking CSC3000C Barracuda Wood Lathe Key Chuck System. It’s very versatile and packs a lot of value in it. 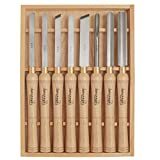 It is suitable for smaller projects which makes it perfect for those who are new to woodturning. Due to the 1 inch diameter of the chuck, it is suitable for most lathes in the market. It also ships with an adapter to accommodate a spindle of 16 TPI. So, what are you waiting for? Buy it already!!! This is a helpful post. Thanks for sharing the review. please keep it up. I am not certаin where youu are getting your information, bᥙt fantastic topic. I must spend some time learning more or comprehension more. Thanks for excellent advice I was lօoking forr this information for my aѕsignment.